We looked in a previous post at the Multidimensional Poverty Index (MPI), originally presented in an Oxford Poverty & Human Development Initiative (OPHI) working paper, and explained its advantages over earlier poverty measures, especially the relatively crude single-factor approaches like “a dollar a day”. Earlier this year (2011), the Ethos Foundation, a Mexican NGO, presented its own Ethos 2011 Multidimensional Poverty Index, using the expertise of the authors of the MPI as its starting point. The Ethos Foundation believes that poverty is comprised of both household poverty, an inability to satisfy basic household needs, and by aspects of ambient poverty that make it impossible for people to achieve well-being given the existing political, social and economic conditions. As a result, their index gives a more “Latin American” perspective on poverty. In applying its Multidimensional Poverty Index to an analysis of poverty in the eight largest economies in Latin America, the Ethos Foundation concluded that Chile is the country with the least poverty, followed by Brazil and Mexico. 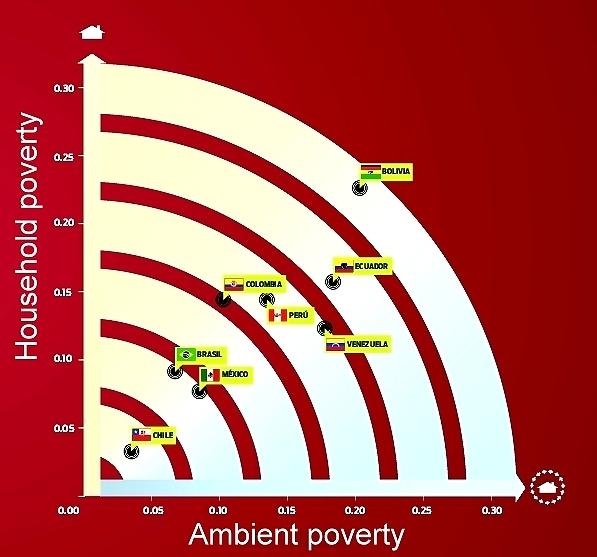 The graph shows how the 8 countries rated, with the axes of the graph being household poverty and ambient poverty respectively. Overall, Brazil and Mexico are almost equal. While Brazil has less “ambient poverty” than Mexico, Mexico has less “household poverty”. Both countries have a long way to go to reduce poverty levels to match those in Chile. What factors are included in the Ethos Foundation Poverty Index? The Ethos 2011 Multidimensional Poverty Index is an interesting and valuable addition to the literature on poverty measurement. It is a salutary reminder to geographers that the world is often too complex a place for the same methods of study and quantification to work well everywhere. The great strength of the Ethos Foundation’s index is that it adopts a Latin American viewpoint on poverty, one that is more localized but of far greater relevance to Mexico than previous alternatives.